Note: On April 24, the Daily Northwestern published an opinion column that included a backhanded and (in my opinion) unfair reference to me and my blog–namely, to my Markwell post. I wrote the following letter to the editor in response. In his Tuesday column, Peter Larson discussed the response to Cru’s Markwell campaign and mentioned one particular “fire and brimstone” blogger whose “gripes” caused him to roll his eyes. 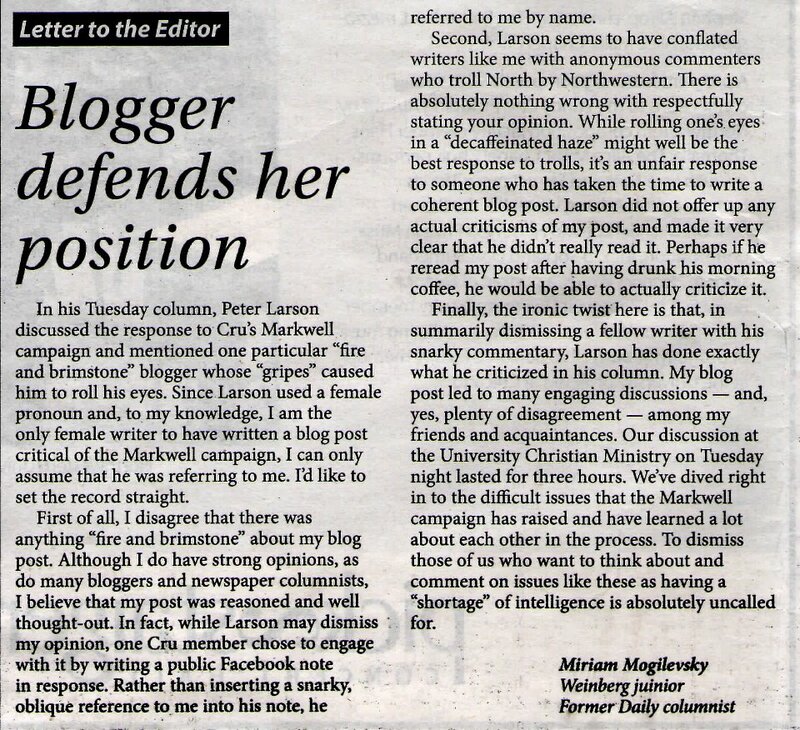 Since Larson used a female pronoun and, to my knowledge, I am the only female writer to have written a blog post critical of the Markwell campaign, I can only assume that he was referring to me. I’d like to set the record straight. First of all, I disagree that there was anything “fire and brimstone” about my blog post. Although I do have strong opinions, as do many bloggers and newspaper columnists, I believe that my post was reasoned and well thought-out. In fact, while Larson may dismiss my opinion, one Cru member chose to engage with it by writing a public Facebook note in response. Rather than inserting a snarky, oblique reference to me into his note, he referred to me by name. Second, Larson seems to have conflated writers like me with anonymous commenters who troll North by Northwestern. There is absolutely nothing wrong with respectfully stating your opinion, as I did and as Larson has done in his column. While rolling one’s eyes in a “decaffeinated haze” might well be the best response to trolls, it’s an unfair response to someone who has taken the time to write a coherent blog post. Larson did not offer up any actual criticisms of my post, and, in fact, made it very clear that he didn’t really read it. Perhaps if he reread my post after having drunk his morning coffee, he would be able to actually criticize it. Finally, the ironic twist here is that, in summarily dismissing a fellow writer with his snarky commentary, Larson has done exactly what he criticized in his column. My blog post led to many engaging discussions–and, yes, plenty of disagreement–among my friends and acquaintances. Our discussion at the University Christian Ministry on Tuesday night lasted for three hours. We’ve dived right in to the difficult issues that the Markwell campaign has raised and have learned a lot about each other in the process. To dismiss those of us who want to think about and comment on issues like these as having a “shortage” of intelligence is absolutely uncalled for. This week’s Daily Northwestern column. As Valentine’s Day approaches, many of us are probably thinking the same thing : Dating is hard. And it is, especially in college. People who look for serious relationships (as opposed to casual dating or hookups) face plenty of challenges, such as jam-packed schedules, breaks away from campus, study abroad semesters, plenty of temptation, and, of course, the constant specter of graduation. I think the friend zone concept is mostly bunk. First of all, the fact that many relationships do start off with the couple being good friends shows that friendship itself isn’t exactly a cold shower. Second, the friend zone seems like a convenient (if well-intended) excuse that people use when a friend whom they see as nothing more expresses romantic interest. After all, it’s never pleasant to have to tell a good friend that, for whatever reason, you just don’t see them as boyfriend/girlfriend material. And often people might not know the reason for that lack of connection: Maybe they just didn’t click with the person, or there wasn’t chemistry, or whatever you want to call it. In such a situation, it makes sense that someone would say something like, “I just don’t see you as more than a friend.” And it makes sense that the person they’re rejecting would conclude that the friendship is the problem. But it’s not. The problem is the person just doesn’t like them that way. Of course, some people do choose not to date a friend they have feelings for because they don’t want to jeopardize the friendship. However, such people are probably simply valuing friendship over romance for the moment, and that’s their choice — it doesn’t mean becoming their friend was a bad idea. Sometimes the friend zone explanation arises when a person puts a lot of energy into being a good friend to someone they’re interested in and gets frustrated when their emotions aren’t reciprocated. Since humans are wired to find patterns, the natural assumption is that the friendship caused their crush not to like them back. However, as important as it is, being a good friend doesn’t entitle you to someone’s romantic attention. In fact, nothing entitles you to that. It makes me sad when I see advice columns in women’s magazines exhorting them not to act like good friends to the men they like for fear of getting “friend zoned.” These columns generally advise women not to do anything overly friendly, such as worrying about a guy’s health or listening to him talk about his problems. Caring actions like these might prompt the dreaded “You’re such a good friend” comment. However, unless you’re looking for the most casual of flings, friendship first makes a lot of sense — it allows you to get to know the person well before getting too invested, it helps them understand your boundaries, and it allows you to make sure that both of you are looking for the same thing from each other. Especially at our age, people vary a lot in terms of the sorts of sexual and/or romantic relationships they’re looking for. Some just want to hook up, some want to date several people, some want an exclusive partner until distance forces them to separate, and others are looking for something serious and long-term. Getting to know a potential partner as a friend first is a great way to prevent hurting each other when you discover that your goals diverge. Besides, if it never develops into anything more, having a new friend never hurts anyone. This Valentine’s Day, ignore the cliched advice and go with your gut. People are either going to like you, or they’re not. But they’re more likely to like you if you treat them well. 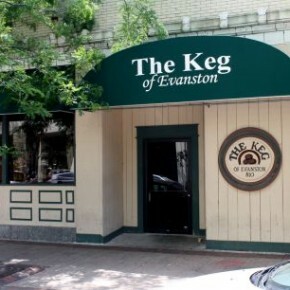 The Northwestern community is abuzz this week with the news that the Keg, Evanston’s trashiest, craziest, collegiest bar, has had its liquor license revoked for continually allowing underage drinking. The loss of the license means that the Keg can no longer sell alcohol, meaning that its demise is probably imminent. Naturally, Northwestern students (many of whom admit to never even having visited the Keg) are enraged. They see the license revocation not only as the end of a place they like to frequent (“like” being used only in the vaguest sense here), but as yet another tyrannical attempt by the city government to disrupt the Northwestern way of life. I must admit that if my life revolved around drinking, I might see some sense in that view. But then again, I might not, given how many bars, frats, and off-campus apartments there are around me–and the latter two usually don’t even charge, let alone card. In a perfect world, the Keg wouldn’t be closing. Why? Because the legal drinking age would be 18, just like the age of consent, enfranchisement, and conscription. In that perfect world, our culture would pay enough attention to mental health that people wouldn’t need alcohol to relax or socialize, meaning that binge drinking would be much less common. But, clearly, we don’t live in that world yet, and for now, as in the future, we are obligated to follow the laws created by our elected government. The Keg’s ownership has proven over and over that it does not take the issue of underage drinking seriously, and it should not be permitted to flagrantly violate the law as it currently stands. In one of the very few intelligent responses to this news that I have seen from NU students, my fellow columnist at the Daily Northwestern points out that closing the Keg will not stop underage drinking. That is correct. Nothing can stop underage drinking among college students aside from lowering the drinking age. However, not revoking the Keg’s liquor license despite its violations of federal law send the message that we value profit and fun over law enforcement. Nowhere in the Constitution are we guaranteed the right to drink alcohol without any reasonable limits. What we are guaranteed, however, is a government with the power to make and enforce laws. Furthermore, while closing the Keg will not prevent underage drinking, neither will ticketing speeders prevent speeding, or cleaning up litter prevent littering. yet both must be done for the sake of a fair and orderly society. Many NU students, of course, don’t look at it this way and have no desire to. They react like a toddler reaching for her fifth piece of candy and having it taken away. In fact, they reacted by creating a fake Twitter account for Evanston mayor Elizabeth Tisdahl. Read it and weep. Also, if you are attacking Mayor Tisdahl you are an idiot. 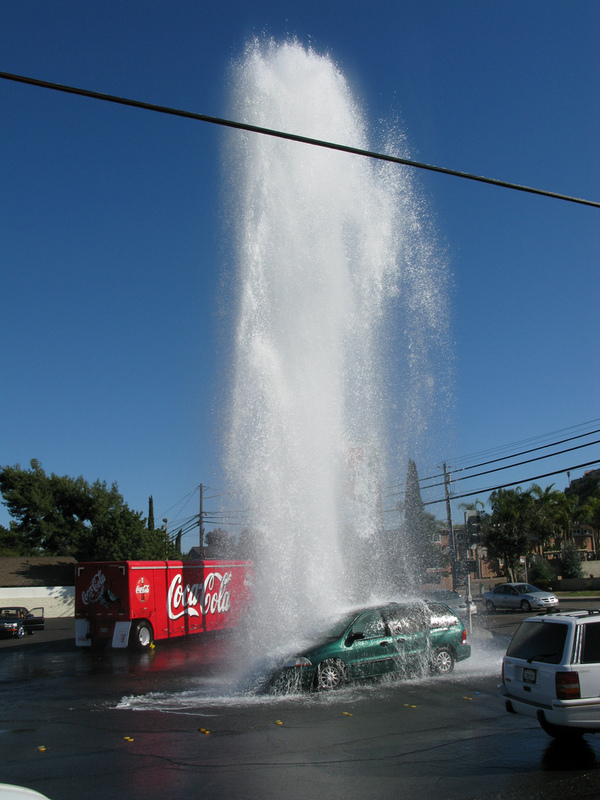 You may not think you are an idiot, but you are. I’m sorry, but anyone who scapegoats an elected official for enforcing the law deserves the title of idiot. And that’s that. For what it’s worth, I applaud Tisdahl for doing something “uncool,” since that’s something that many Northwestern students are apparently incapable of. I’ve also seen a lot of comments from other students bemoaning the fact that the Keg’s closing means that their social lives are, for all intents and purposes, dead. I don’t know how many of these are “ironic” as opposed to genuine, but I do know that “irony” is a defense frequently trotted out by people who have been caught saying something idiotic. If any of those comments do have any truth to them, I have only this to say–if your entire social life consists of getting wasted in a grimy bar, that is really sad. Finally, and perhaps most irritatingly, many students are reacting to the closure of the Keg as though some irrevocable, unique part of Northwestern culture is gone. An article to this effect was even published at North by Northwestern. People. Seriously. Seedy bars where you can get piss-drunk are a dime a dozen. Go to any college town in the country and you’ll see that. For people like me, who observe what most call “college life” only from the sidelines, the Keg’s imminent closure is both a cause of celebration and, well, of consternation. The former for obvious reasons, and the latter because it’s quite disappointing to see one’s fellow students ranting and raving over the closing of some dumb bar as though they’ve just gotten rejected from their favorite country club or something. For now, though, I’ll leave you with this hilarious take on the Keg’s closure from Sherman Ave. Don’t watch if you’re easily offended.